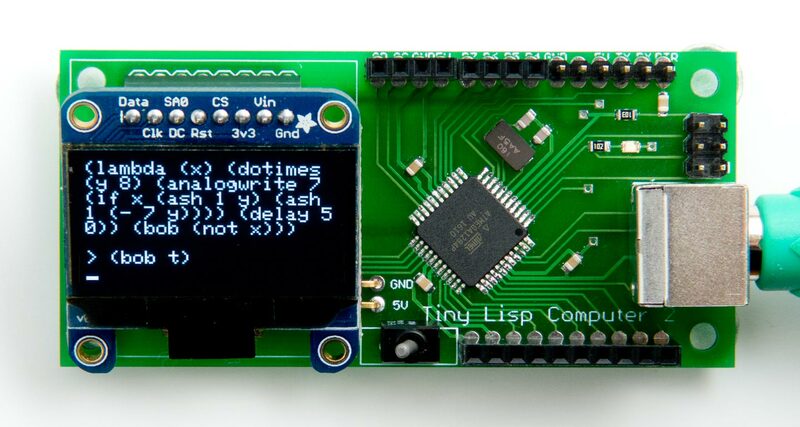 The Tiny Lisp Computer PCB, based on an ATmega1284, that you can program in Lisp. The PCB Eagle files are available from Github; see the link at the end of the article. The computer is programmed in uLisp, my compact Lisp interpreter for the Arduino. This allows you to control the I/O ports directly, access I2C and SPI peripherals, and write small programs to automate functions. You can also save programs to EEPROM so they are retained when the power is disconnected, and they can be configured to run automatically on restart. The board includes a connector for a PS/2 keyboard. I tested it with the Adafruit PS/2 keyboard , a compact low-cost keyboard that also supports USB. Alternatively there are low-cost PS/2 keyboards available on eBay. I designed the PCB in Eagle and ordered a batch of boards from Seeed Fusion . It outputs the values 1, 2, 4, 8, 16, 32, 64, and 128 to the analogue output, then the same values in the reverse order, and so on until you stop the program by pressing the Esc key. The external connections on the Tiny Lisp Computer PCB. The PCB uses 0805 resistors, capacitors, and an LED. I used a Youyue 858D+ hot air gun at 250°C to solder the SMD components onto the front of the board, but with care it should be possible to assemble it by hand using a fine-tipped soldering iron. The PCB is designed for a two-pad SMD crystal. I used an Abracon ABM7 16.000MHz type. The board accommodates the Adafruit 1.3" 128x64 SPI/I2C OLED display, which is based on the SSD1306 driver chip , or in the UK from Proto-PIC  or Pimoroni . I plugged the display into an 8-way header socket, so it sits up at an angle from the PCB. The board also accommodates the 1.3" 128x64 SPI 7-pin OLED displays available from Banggood  or AliExpress. These are based on a slightly different driver chip, the SH1106. A constant SH1106 in the program should be set to 0 for SSD1306 displays (the default), and 1 for SH1106 displays. You should then be able to disconnect the Arduino Uno. The next step is to install the Tiny Lisp Computer code, using an FTDI USB-to-serial converter plugged into the FTDI connector on the PCB. There are several alternatives available; I used the FTDI Basic Breakout from Sparkfun , available from HobbyTronics in the UK . 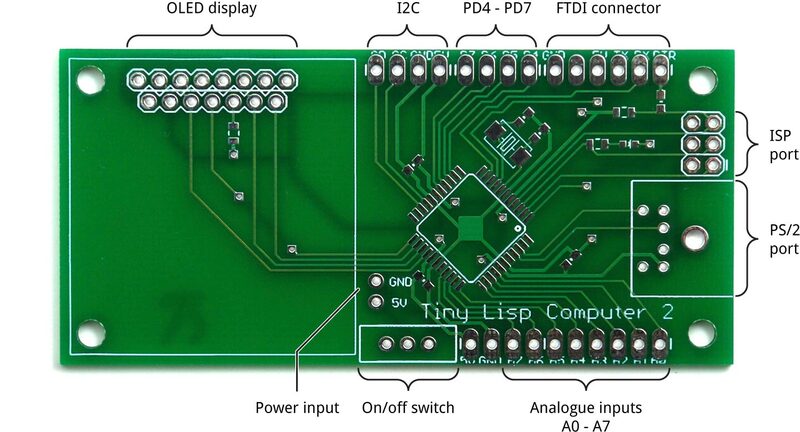 Get the latest Tiny Lisp Computer source from GitHub, together with the Eagle files for the PCB so you can make yourself a board, at: https://github.com/technoblogy/tiny-lisp-computer. ^ Seeed Fusion PCB service. ^ 1.3 Inch 7 Pin White OLED 128x64 SPI Interface Display Module on Banggood.